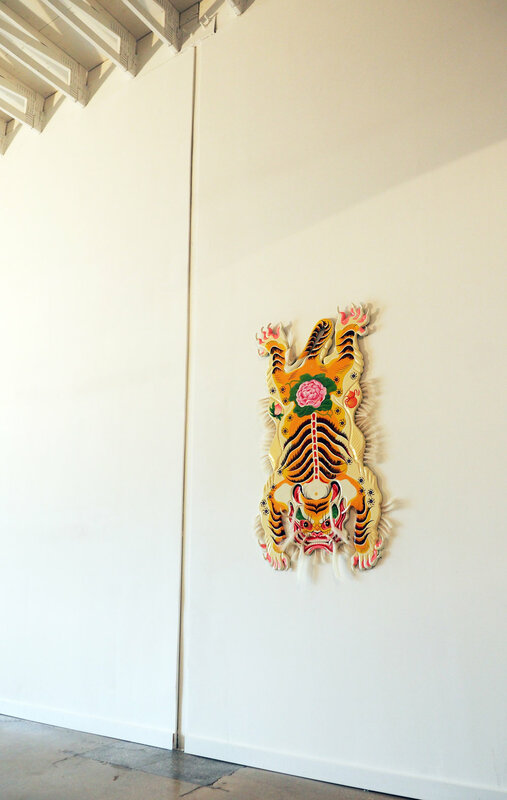 More than any other artwork, First Flower Tiger Pelt best displays Boy Kong's skills as a craftsman and as a painter, and best represents him both as an artist and as an American. I have been working with Boy since 2012, and see this piece as a turning point, the first fully mature artwork I felt he had ever completed (in late 2016). Boy spent a month hand carving the the tiger pelt, which is created from one piece of wood, but for the teeth and the nails. Its form is based on traditional Tibetan Tiger rugs, and the artwork blends various Asian art styles, Chinese, Japanese, Korean, et al. I find this particularly meaningful, b/c of Boy’s own blended heritage, IE Vietnamese, with some Chinese heritage, and a youth spent in suburban Orlando. Finally, the cutout is a wonderful piece of folk art, and it's strength and virility feel especially powerful since it was created during a period - October/November of 2016 - when many 'outsiders' were made to feel less American. The symmetrical beauty and long-lasting quality of the flower have long been appreciated by young lovers as the token for expressing devotion to each other. The peach (tao 桃) symbolizes longevity and peach charms are very commonly seen in China. The gourd is popular as a charm to ward off evil spirits and disease because its first character (hulu 葫芦) has the same pronunciation as the word to "protect" or "guard" (hu 护) and also the word for "blessing" (hu 祜).